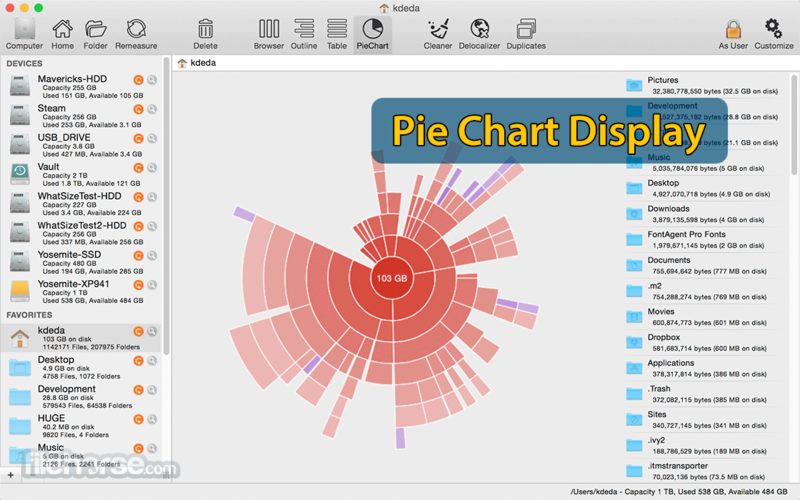 WhatSize for Mac is an application that allows you to quickly view and manage disk space usage and speed up your Mac. WhatSize allows you to quickly measure the size in bytes of a given folder and all subfolders and files within it. You would be surprised at how many useless files might be laying around on your hard disks. The files and folders are automatically sorted by size, with the biggest sizes first. WhatSize helps find out what files are taking up all of that space. Then it makes it really easy to remove or move those files. You'd be surprised how many useless files are lying around on your Mac's hard disk. While the app is measuring a folder the user can browse the files within that folder and immediately see the size in bytes. Hidden files, cache files, directories will all show up with their corresponding size. This application is similar to the ancient NeXTSTEP, DarkForest. Once the measuring of a folder has ended the user can also view the information by filtering for particular file sizes or types. The user can also move unwanted files and folder in the corresponding Trash bin similar to the Finder's Delete button. 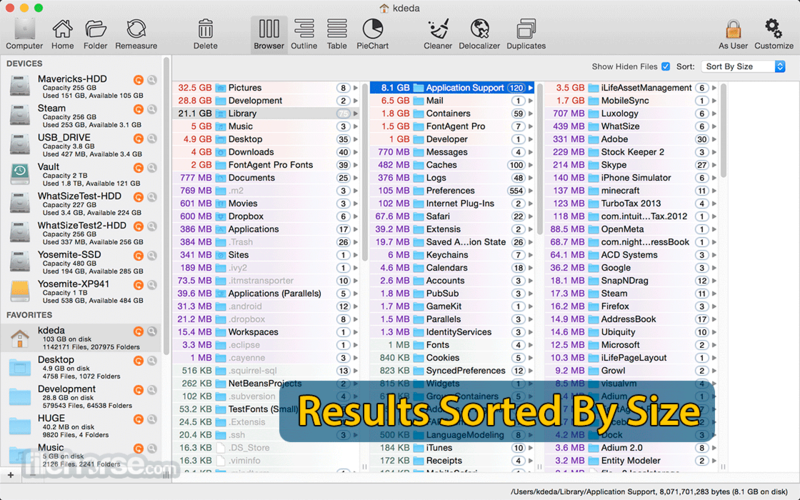 WhatSize for Mac quickly measures the size of your hard drive and allows you to sort, filter, and refine the results. The files and folders are automatically sorted by size with the biggest sizes first. The application will cache measurements for speed and will use Apple's FSEvents to merge file system changes live. A visual display of the contents of your hard drive that enables you to drill-down and discover how your disk space is being used. Intelligent tools allow you to remove IN ONE CLICK log files, download files, cache files, temporary files, nib files, localization files. Files you do not need or Files the app developers forgot to remove. So you can reclaim disk space and speed up your mac. Identifies duplicate files on your system so that you can move them to trash, replace them with hardlinks or simply delete them immediately. 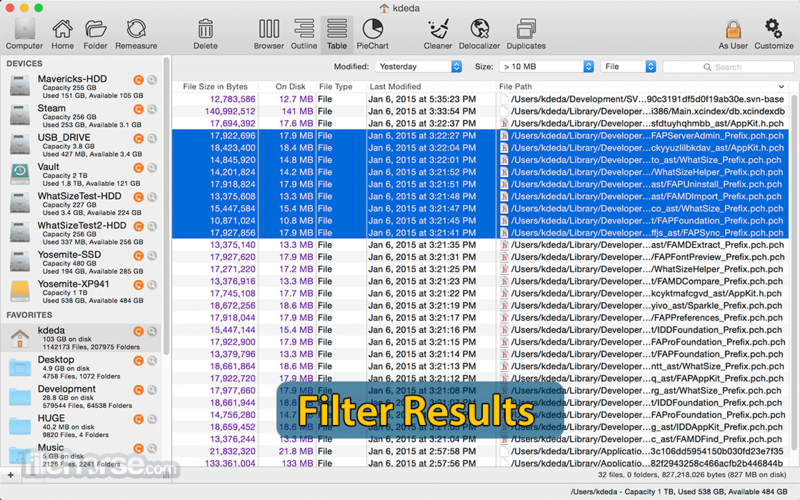 Filter by size so you can deal with just the largest files first. Smart caching and FSEvent support allows real time updates of the duplicates. You would be surprised at how many useless files might be laying around on your hard drive. Note: Will measure up to 20 GB of data. Requires 64-bit processor.